Tan y Foel Country Guest House Guest HouseWelcome to Tan Y Foel Country Guest House - A 5-star country guesthouse that takes pride in combining luxurious accommodation with award-winning cuisine and an exceptional level of personal service. Located just outside the attractive village of Betws-y-Coed, Tan Y Foel is a little piece of heaven for those seeking bed and breakfast in Wales. Dating in part from the 16th century, the house has been sympathetically refurbished and exquisitely styled to fuse period charm with contemporary design. Tan Y Foel has the air of a boutique hotel with a choice of sumptuous, individually styled, en suite rooms. Enjoying a peaceful setting amid mature, landscaped gardens that afford views of the snow-capped peaks of Snowdonia National Park, Tan Y Foel is appreciated by guests who return time and again - please see our accommodation reviews. A private family residence established as Country Guest House accommodation since 1991, we pride ourselves with having created a little piece of Welsh heaven, appreciated by guests who return time and time again to North Wales. Our holiday accommodation in Wales is honoured with many highly regarded appraisals from some of the various prestigious guides - The Good Hotel Guide, Michelin, Welsh Rarebits, Best Loved Hotels, Historic Hotels and The AA Britains's Best Bed & Breakfast Guide for providing the highest levels of accommodation, culinary excellence, service and comfort. Six extremely well-appointed luxurious en-suite guest bedrooms - one with a four poster king bed are all decorated with imaginative flair. Three en-suite bedrooms are located in the main house and afford spectacular views of the lawn and beautiful mature gardens, that blossom with rhodedendrum, azalea and magnolia throughout Spring and Summer. Equally enjoyed throughout Autumn and Winter with vistas of the glistening snow-capped peaks of Snowdonia and the surrounding Conwy Valley. Two en-suite bedrooms adjoin the main house; the first is situated on the ground floor and is ideal for guests that prefer accommodation without stairs. The second is our Junior Suite, a converted hayloft, accessed by several outside steps offering private, unique and luxurious accommodation with magnificent views. All of our bedrooms are furnished with both bath and shower facilites, complimentary tea/coffee trays, direct dial telephones, DVD/CD, flat screen TV's and Wi Fi. Bathrobes, hairdryers and luxury toiletries provide thoughtful touches in the en-suite bathrooms. Welcome to Tan Y Foel Country Guest House - A 5-star country guesthouse that takes pride in combining luxurious accommodation with award-winning cuisine and an exceptional level of personal service. Located just outside the attractive village of Betws-y-Coed, Tan Y Foel is a little piece of heaven for those seeking bed and breakfast in Wales. Dating in part from the 16th century, the house has been sympathetically refurbished and exquisitely styled to fuse period charm with contemporary design. Tan Y Foel has the air of a boutique hotel with a choice of sumptuous, individually styled, en suite rooms. Enjoying a peaceful setting amid mature, landscaped gardens that afford views of the snow-capped peaks of Snowdonia National Park, Tan Y Foel is appreciated by guests who return time and again - please see our accommodation reviews. 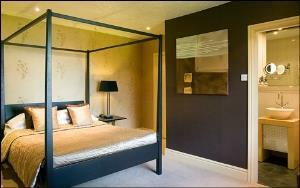 Guest accommodation is individually designed to be the very antithesis of large impersonal hotels. We regret we that have a minimum age restriction of 12 years for children and we do not take pets. Children welcome from age 12.